My love for illustration has blossomed into a passion for branding and identity. A maker friend of mine has an adorable etsy shop featuring cute crochet critters. I was asked to re-brand her company. 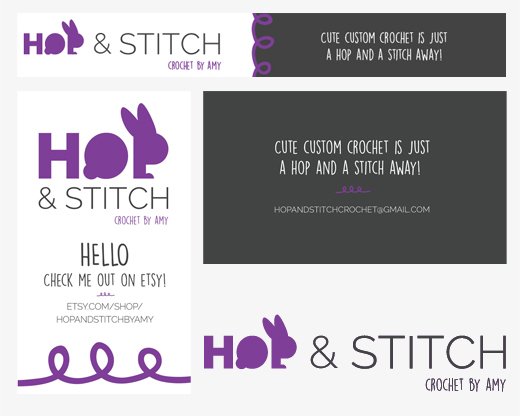 I gave her a new name and tag line, Hop & Stitch, Crochet by Amy. Cute Custom crochet is just a hop and a stitch away! It was important to have a dutch rabbit and the color purple integrated into Amy's new identity. I successfully achieved a cute and clever logo that represents Amy's craft and personality perfectly.